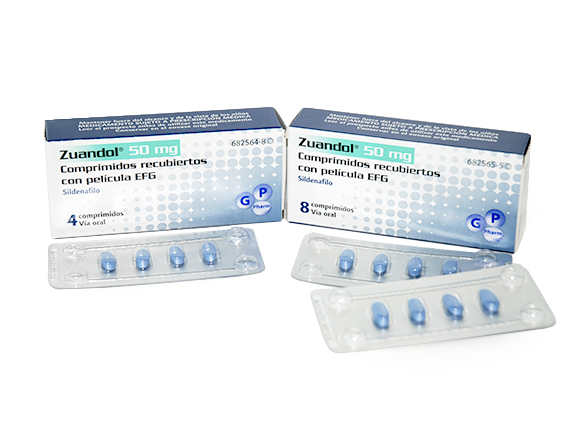 ZUANDOL® (Sildenafil) is used for the treatment of men with erectile dysfunction, which is the inability to achieve or maintain a penile erection sufficient for satisfactory sexual performance. In order for ZUANDOL® to be effective, sexual stimulation is required. Sildenafil is a potent and selective inhibitor of phosphodiesterase type 5 (PDE5) specifies cGMP in the corpus cavernosum, where PDE5 is responsible for the degeneration of cGMP. ZUANDOL® is presented in three different strengths (25mg, 50mg and 100mg) and in packages of 2,4 or 8 tablets. They may be marketed pack size.